With our "you make it, you bake it, you grow it, you sell it" philosophy, you will find a wide variety of local products to fullfill your "100 mile diet" needs year round! Every Saturday morning, rain or shine, come for the freshest local fruits and vegetables, baking, jams & jellies, honey, crafts, clothing, pet treats, and more! 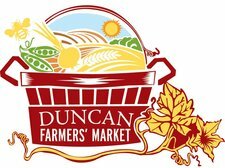 Please join us in the Market Square in downtown Duncan (look for the clock tower) every Saturday and help make your year-round farmers' market the best in BC!